Hallford Brothers Security Lock and Safe has been a part of the Cobb County/North West Georgia community for over 50 years. We have been providing great customer service to our residential and commercial customers from our current location, 705 Roswell Street, Marietta, for 25 years. 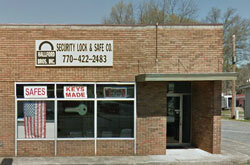 We are one of the last locksmiths with a storefront in the Cobb County area. Our customers feel comfortable knowing that one way they can get quick reliable service is by walking into our store and talking through the issue at hand with a friendly, expert locksmith. Our experience, knowledge and willingness to help gives our customers the confidence that their needs will be satisfied quickly and professionally. Additionally, many of our customers enjoy the ease of being able to call us on the phone to schedule a technician to do the work on-site. Either way, we provide upfront pricing so you will know the cost before the work begins. Unfortunately, most of our fly-by-night competitors only operate from a van, so you may not be able to locate them later, and many will change their price after the work is done. With us, if you need us after we do the work, we are always a short drive or a phone call away. Hallford Brothers Security Lock and Safe remains a trusted partner of many local churches, businesses, restaurants and municipalities and is a long-time member of the Associated Locksmiths of America. We are a full-service locksmith with an inventory that allows us to fulfill most common locksmith jobs immediately.